Mosaic artist Jim Valentine creates handmade unique pieces made with ceramic tile. His specialty is automotive related subjects. The wall hangings are aluminum framed and come with a hanging wire on the back. 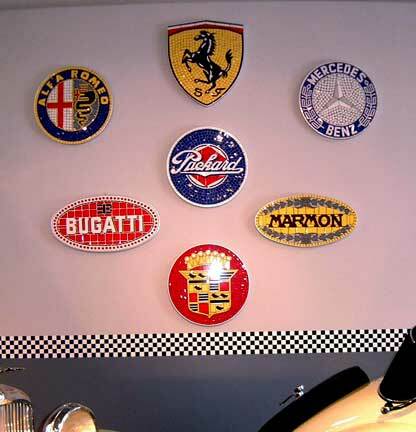 The wall hangings are the perfect garage decor. For inlaid applications such as walls and floors – the tile pieces are glued onto a fiberglass mesh. Your tile installer can easily mount the mesh and apply grout. If you are installing the mosaic in a floor or wall please state so when ordering. Custom mosaics (any subject) can be created from a photo or company logo. Will do custom mosaics - company logos, automobiles or any subject. Please contact us to order. We accept MasterCard, Visa and Discover. OR - Click on the "Buy Now" button and enter the mosaic title and price. No affilliation to manufactures is claimed and copyright remains the property of all respective owners.